A famous family makes its choices and knows their costs. Among these is the reality that the deepest moments in the family’s life are not suffered or savored in private but played out on the vast public stage. When the Kennedys are most lost, they have to show the way; when they want to hide, they are expected to lead. It has been this way in life  and particularly in death  for decades. Joe Kennedy Jr.  the oldest brother  was his ambitious father’s namesake, and repository of all his hopes. On Aug. 12, 1944, he was sent on a secret mission so important that it was filmed in a tailing aircraft by the President’s son, Colonel Elliott Roosevelt. But the plane he was flying, loaded with 23,000 lb. of an explosive twice as powerful as TNT, exploded in an immense fireball before Joe could bail out. The family was gathered in Hyannis Port, Mass., when two priests appeared at the door. Mother Rose was consumed by grief; Joe Sr.  a former ambassador to England  made all the funeral arrangements. “There is something about the firstborn that sets him a little apart,” he wrote to one friend. “He represents our youth, its joys and problems.” Younger brother Jack assembled a book of reminiscences, As We Remember Joe. The death was public, but in the pre-TV era, the mourning was blessedly private, as was the mourning for daughter Kathleen in a plane crash in France in 1948. She was the one who insisted he be buried not at home in Massachusetts but at Arlington National Cemetery, the last resting place for soldiers. 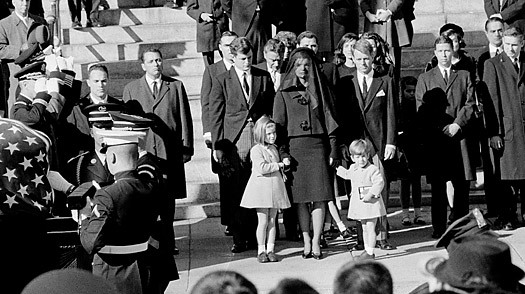 She asked aides to research the burial rites of another martyred President, to make her husband’s “as Lincoln-esque as possible.” The networks would run nonstop coverage; a million people lined the streets for the procession from the White House to the Cathedral. The flag-draped casket was pulled on a caisson  the same one that had carried FDR  by six gray horses; a riderless horse named Black Jack followed behind, a sword hanging from the black saddle, a pair of boots reversed in the stirrups  a sign that a commander had fallen and would never ride again. When the service was over and the coffin left the church, the band struck up a sad, slow “Hail to the Chief,” and the late President’s daughter Caroline brushed away a tear. His son John Jr. was supposed to have his third birthday party that day. Instead he gave the world a gift: he saw the flag-draped casket approach, his mother bent and whispered in his ear, and he raised his hand in salute. Is AIG Spending Too Much on Public Relations?